Welcome to the create a Smile August Release Blog Hop! For my project I went for Jessa's challenge !anything but a card". I used different images from Jungle Fever, masked them and created a one layer piece with stamping, colouring and inking, I then cut that piece into a puzzle shape with my Silhouette. The same shape was cut from cardstock twice and then I layers and the pieces together. to give it a ice finish I covere each piece with 3 layers of clear embossing powder. I think that makes a nice little gift. Thanks, Jessa for your inspiration! Thanks for stopping by, Enjoy the hop! 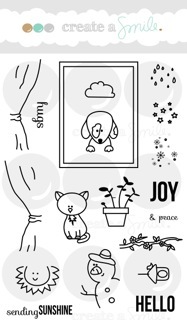 this is such a great idea - I will try this for my kids - awesome new stamp sets! As I mentioned before this is so so incredible clever love it. Es ist nicht nur "Anything but a card" es ist ja auch ein kleines Geschenk. Toll! Obwohl ich ein Puzzle-Trauma habe :D Deine neuen Sachen sind so schön, ich bin ganz verliebt. wenn ich mir das so angucke... - verdammt, ich brauche auch so eine "Puzzle Making maschine"
WOW!! what a fun idea..LOVE it! 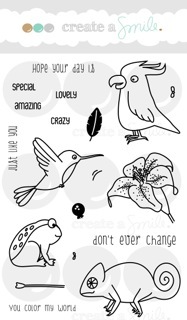 great new stamps..such cute images..love them. WOW...I LOVE it...a puzzle! How FUN!!! Oh my! What an incredibly cute idea!! Love that puzzle! Wow! What a cool idea! And your coloring is gorgeous! What a fun way to send a greeting - your work is beautiful! Love the chameleon. Looks like the one in a paint commercial that I see on TV. The hummingbird and the flower are colored so nicely. 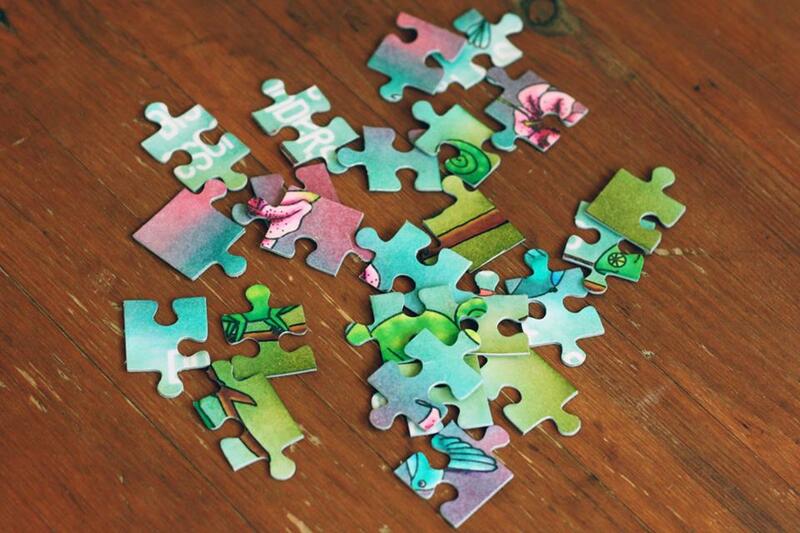 Love the idea of the jigsaw puzzle. thanks for sharing a fun gift. 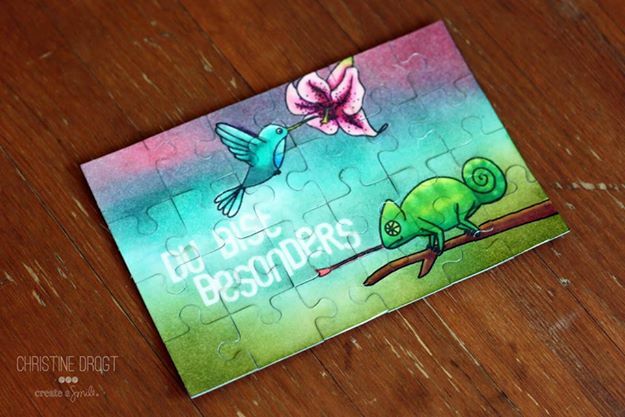 the amazingness of this puzzle is beyond words! WOW!!! the colors, the sky! i am not even exaggerating when i say it looks like you bought this in the store! it's flawless! wow! so incredibly cool!!! What a great little gift for so many different occasions! Super pretty coloring, Christine! Stunning idea and amazing execution :) love the beautiful scene u created ! Und wieder so eine tolle Idee! Du bist eine kleine (oder wohl eher große) Wundertüte! Das ist Puzzle ist einfach klasse! Vielen Dank für die Inspiration. A puzzle and matching pillow box? How incredibly clever! Awesome idea! Hummingbirds are my favorite! 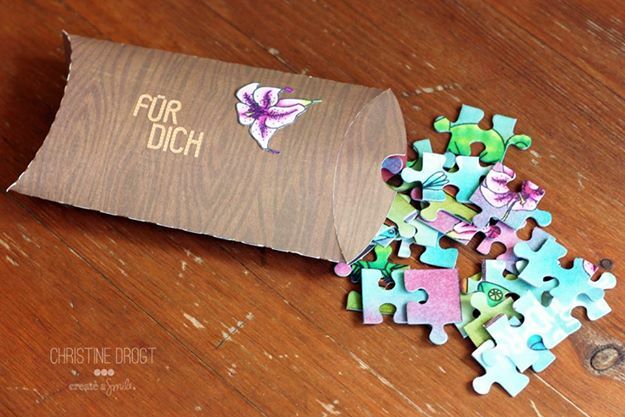 Was für eine tolle Idee,dein Puzzle!! Echt eine schöne Geschenk Idee!! Wunderschön geworden!!! I love the puzzle! So smart to cover in clear embossing powder! Great idea and love the colors. Wow, was für eine Arbeit! Aber das Puzzle ist total großartig geworden. Eine richtig tolle Geschenkidee. Danke für die Anregung. Wow! Colorful, creative and smart!